I loved teaching yoga from 1993 until 2017... twenty-four years! My naturopath business has taken off, and so I no longer teach yoga, focusing on my passion of weight loss and helping my clients heal their ailments naturally. I began practicing yoga in 1990 and it completely transformed my life! In 1993 I traveled to India to do my yoga teachers' training course with the international organization, Sivananda yoga. This was part of an around the world spiritual journey that lasted one and a half years. I loved teaching and sharing my passion for yoga with others. In my classes I hoped to allow my students to experience the many benefits of yoga: the physical benefits - gaining flexibility and strength, and the mental benefits - de-stressing and working towards inner peace, balance and calm. I taught in India, Thailand, Nepal, and it was such an absolute joy to share my passion with thousands of students, allowing them to transform their lives as it completely transformed mine. 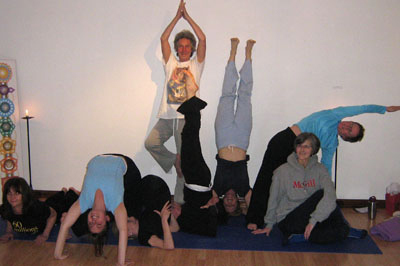 ...I taught in a beautiful wellness center in the West Island of Montreal. If you are an absolute beginner and worried that you are not flexible enough to join in, you are in the right place. For me, yoga is not about doing perfect postures, as few people can. Yoga is about working with our bodies, accepting our bodies and our limitations and slowly improving over time. I always offer more gentle variations of the poses so that everyone can proceed at their own pace. Yoga is so much more than exercise. We work the body and the mind at the same time by focusing on the breathing and letting go of the stress of our day. Yoga is about taking the time to do something good for ourselves - our body, our soul and our mind. The information contained here is designed for educational purposes only, Not as a substitute for informed medical advice.